Bent up bars along with stirrups. These are the steel bars vertically placed around the tensile reinforcement at suitable spacing along the length of the beam. Their diameter varies from 6 mm to 16 mm. The free ends of the stirrups are anchored in the compression zone of the beam to the anchor bars (hanger bar) or the compressive reinforcement. 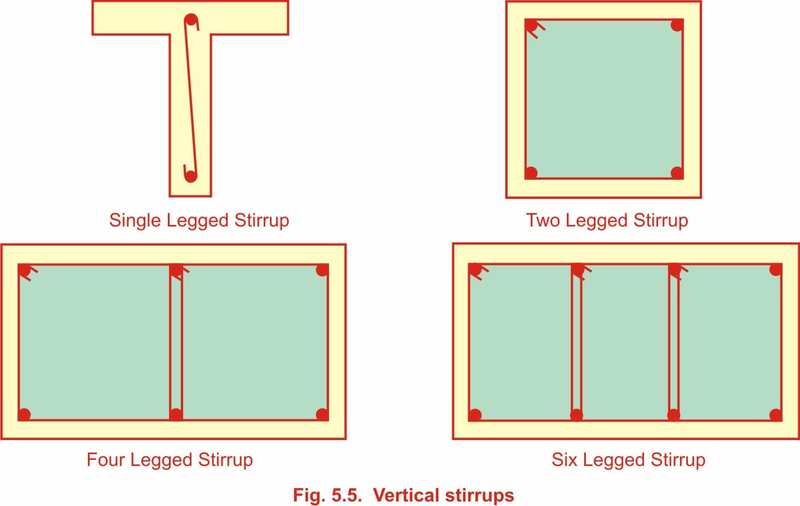 Depending upon the magnitude of the shear force to be resisted the vertical stirrups may be one legged, two legged, four legged and so on as shown in Fig. 5.5. It is desirable to use closely spaced stirrups for better prevention of the diagonal cracks. The spacing of stirrups near the supports is less as compared to spacing near the mid-span since shear force is maximum at the supports. 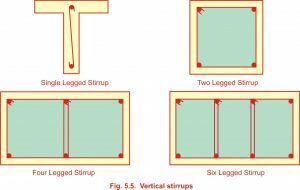 Some of the longitudinal bars in a beam can be bent up near the supports where they are not required to resist bending moment (Bending Moment is very less near the supports). These bent up bars resist diagonal tension. Equal number of bars are to be bent on both sides to maintain symmetry. The bars can be bent up at more than one point uniformly along the length of the beam. These bars are usually bent at 45º as shown in Fig. 5.6. This system is used for heavier shear forces. The total shear resistance of the beam is calculated by adding the contribution of bent up bars and vertical stirrups. The contribution of bent up bars is not greater than half of the total shear reinforcement. 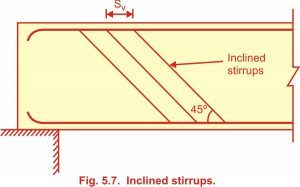 Inclined stirrups are also provided generally at 45º for resisting diagonal tension as shown in Fig. 5.7. They are provided throughout the length of the beam.